Photo taken on September 22, 2012. 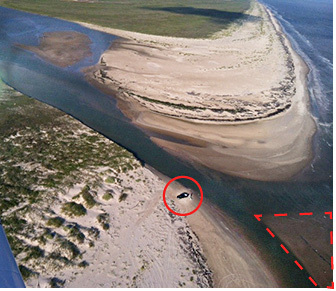 The dotted line shows a sand bar spliting the mouth into two very shallow channels, unsuitable for boat traffic, as it flows into the Gulf. Inside the circle, a vehicle from Sargent to the west, is parked on the west bank. A large sand bar continues to form on the east bank.